The S90 (shown) is Volvo's top-selling sedan. Volvo Car Group reported its biggest operating profit and best operating margin for a first half in six years, continuing its steady rise since Zhejiang Geely Holding purchased the automaker from Ford Motor in 2010. 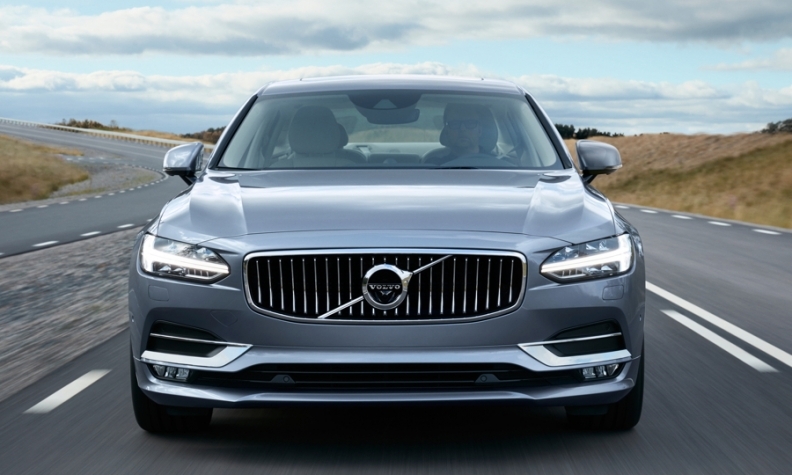 Volvo’s profit increased 21 percent to 6.8 billion crowns ($820 million) in the first half while its margin improved to 6.8 percent from 6.6 percent as demand for its S90 flagship sedan and XC60 pushed the automaker toward a fourth-straight year of record vehicle sales. First-half revenue at the automaker increased 18 percent to 99.1 billion crowns as its global volume rose 8 percent to 277,641 cars. The company’s financial gains came despite its ongoing heavy investments in new cars, such as the XC40 that debuts later this year, its new U.S. factory in South Carolina that starts production next year and new technologies, Volvo said Thursday. "I’m very satisfied with the result especially considering all the extraordinary costs we have had," Volvo CEO Hakan Samuelsson told Automotive News Europe. "We growing much faster in revenue and profitability than we are in car sales, which I think indicates we are moving into more premium level." Samuelsson had another takeaway from Volvo's first-half results: "You could say that 800,000 sales and an 8 percent profitability are within reach." Volvo aims to increase global sales to 800,000 by 2020 from a record 534,332 vehicles it sold in 2016. It also wants to achieve an 8 percent profit margin by 2020. Volvo was helped in the first half by strong demand in Europe and China. In Europe, Volvo boosted vehicle sales 7.4 percent to 160,836, according to industry association ACEA. That increase outpaced the European market's overall growth of 4.6 percent. In China, the automaker’s volume jumped 28 percent to 51,914 units. The gains in China and Europe helped offset Volvo’s 7 percent sales decrease to 34,102 units in the U.S.
Volvo expects to turn around its U.S. sales and report “solid full-year growth after a strong second half,” it said Thursday. It blamed the U.S. decline on delivery constraints experienced during the first quarter.